Pope Francis has paid tribute to former Archbishop of Westminster, Cardinal Cormac Murphy-O'Connor. Francis said he was "deeply saddened" to learn that the 85-year-old has died after a battle with cancer. The pontiff sent a message of condolence to Cardinal Vincent Nichols, the current Archbishop of Westminster. "I hasten to offer my heartfelt condolences to you and to the clergy and faithful of the Archdiocese," he wrote. "Recalling with immense gratitude the late Cardinal's distinguished service to the Church in England and Wales, his unwavering devotion to the preaching of the Gospel and the care of the poor, and his far-sighted commitment to the advancement of ecumenical and interreligious understanding, I willingly join you in commending his noble soul to the infinite mercies of God our heavenly Father." Cardinal Murphy-O'Connor, who became leader of the Roman Catholic Church in England and Wales in March 2000 before retiring from his role in 2009, was admitted to hospital last month. He died "peacefully" surrounded by his family and friends, according to Cardinal Nichols. A spokeswoman for the Catholic Church in England and Wales added he died at 3.15pm on Friday. 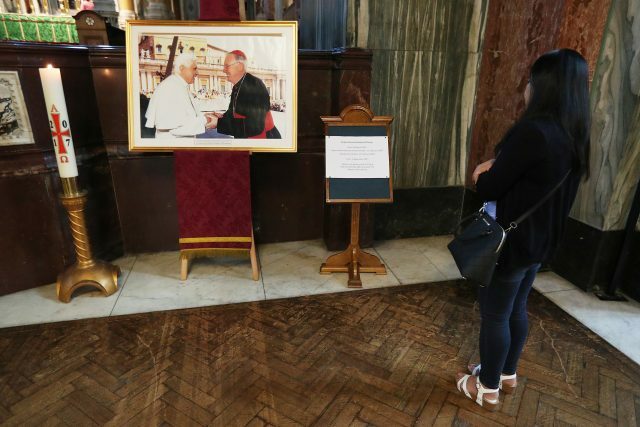 Cardinal Nichols said his abiding memory of his predecessor was his "infectious laughter and his sense of fun", as well as his love of music and the piano in particular.